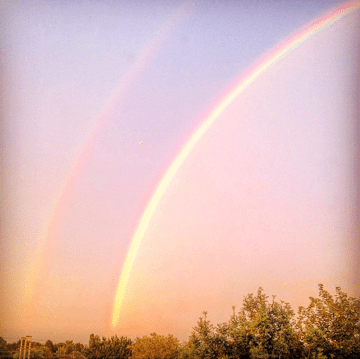 Rain, sunshine, hot, cold, summer, autumn… I think Mother Nature doesn’t know if she’s coming or going at the moment. I know the feeling. So much is right here, but will it be time to move on? We’ve been wondering for a while if we need to pack our bags and move on. The problem is that there are so many things right with where we live – in the house itself, the smallest smallholding and the town – but then again, there are quite a few things a bit wrong that are starting to grate on me more and more. 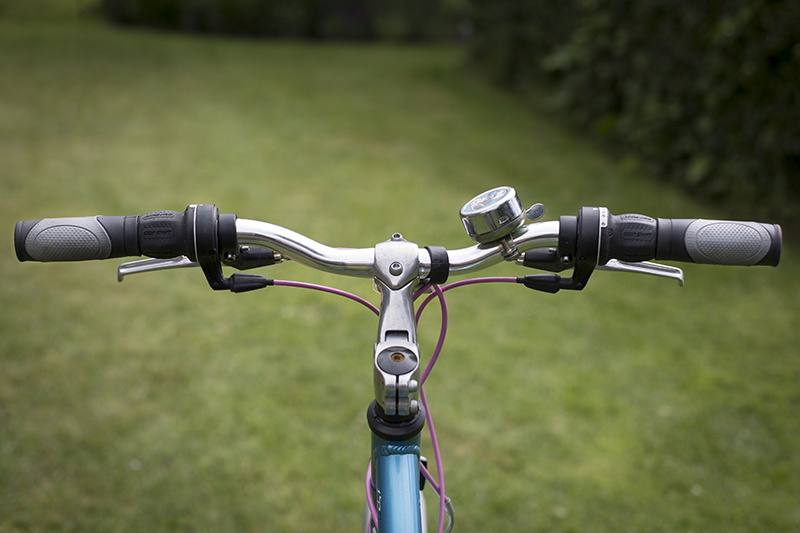 Pros – we’re well connected to motorways and railways lines straight into London, so getting somewhere in the UK (or out of it) is pretty easy by average standards. We’ve got beautiful countryside on our doorstep. We’ve got a Waitrose up the road (because it’s always good to have an alternative to Tesco), dentists, doctors, hair salons, restaurants, vets, dry cleaners, gift shops, plumbers, DIY store and a big badass shopping centre all within relative spitting distance. The schools are generally OK here and the high school is one of the best in the county and region. The land we have with our crumbling down house is unprecedented in this area. We’re really quite spoiled. I feel hemmed in. We’re forced to listen to our neighbours’ teenage son swearing and shouting EVERY DAMNED NIGHT as he plays Call of Duty or whatever MMORPG it is that gets him so flippin’ angry and sweary. Then there’s the screaming children. The relentless screaming children and their apparently oblivious or absent parents. The retired dudes with their infatuation with power tools. The railway line. The hum of traffic. The constant and expanding building that’s making the countryside feel like that litter bit further away. I don’t know if we’ll ever find a better option, on our budget. Rich doesn’t want to go further north (where you get more for your moolah) because his family is based down south. And that’s really fair enough. I’d love to get closer to the sea as we’re about as far away from the sea in the UK as you can get, and I’d like to have a little bit more space to myself. I’m quite an insular person with a very active imagination, so being a little bit more remote would be OK.
1) Cats. We have lots of them. Four to be exact. And they need their own space. So being anywhere near a slightly busy road, on an estate with piddly gardens or in a tiny one-bedroom cottage (which is pretty much our budget in the nicest areas that we’d like to move thanks to rising house prices) isn’t an option. 2) We really HAVE been spoiled and I don’t want to regret leaving this place and the land. I could live in a two-bed house on the smaller side if it meant having plenty of outdoor space to ourselves. But in East Anglia, the South East or South West, I’m not sure that’s an option. Unless we live in the back of beyond with crap Internet (needed for remote working for both of us) and no services. 3) I want to stay in a commutable distance of work (Cambridge). I currently travel an hour once a week for the office and to have face-time with my wonderful colleagues (they really are a fantastic bunch) so adding on a little extra wouldn’t be so bad. But it does limit our options as far as finding somewhere a bit rural, a bit nice, and commutable. 4) Money. Savings. Rising house prices. Ridiculous deposits. 5) I’m going off the idea of older properties, simply because we’ve had constant work to keep this 1919 cottage from falling down. The idea of a new-build is getting more and more appealing but we’ll never EVER be able to do that outside of an estate-setting (what is with estates these days?!) or with enough land. And building our own is just not an option, given the amount of savings we’d have to accumulate. 7) Everywhere I’d like to live is just Too. Damned. Expensive. How can we make it work? I spend so much time at home that it HAS to be right. My friend Maria – also known as Feisty Tapas – and I have been working together for over one and a half years on the same project, and over that time have discovered a mutual love of food (despite the fact that I’m vegan and Maria is Spanish and is obsessed with chorizo), social media, blogging and… mugs! 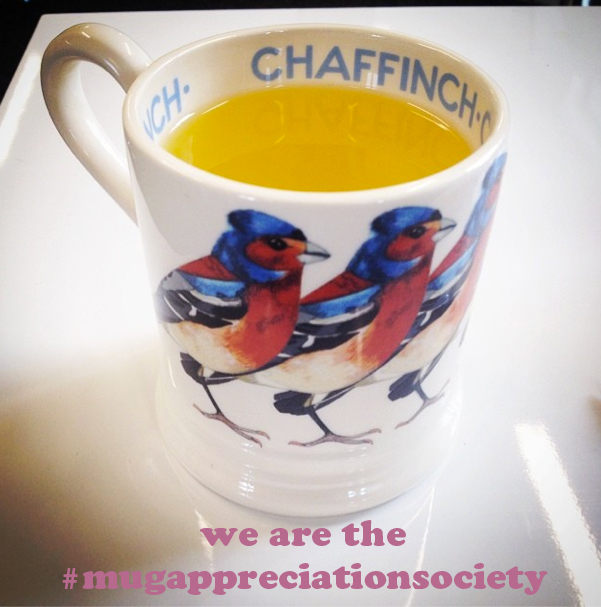 So after chatting over our respective morning cuppas at the creative agency where we both work (I had hot orange, Maria is a coffee fiend) we had a fun little brainstorm about sharing our love for mugs on Instagram. Maria has been encouraging me to Instagram more and more, as there are huge communities out there dedicated to all the things I love – growing your own, veganism, good food, CAKE (lots of cake) and wildlife friendly gardening. And mugs. Mugs are great and I use them for pretty much all tipples… hot chocolate (with hazelnut milk), orange squash, herbal tea, wine, G&T, and I imagine I’ll be enjoying my forthcoming batch of sloe gin in a mug too. I’ll even eat homemade soup out of a large mug. I have no shame. I just prefer drinking out of mugs, and there are so many designs that reflect my general ethos on life. If it’s got any kind of wildlife on it, I’m all over it. Flowers? Yes please. Cats? Everybody needs at least one cat mug in their life! And the bigger the mug, the better. But let’s rewind. 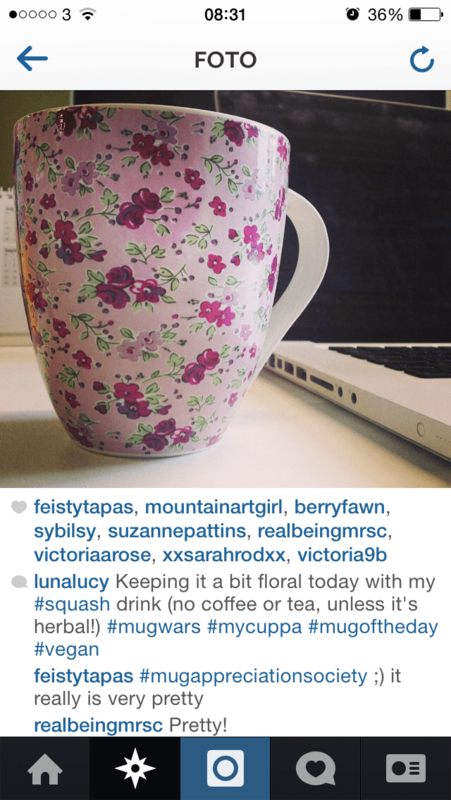 On spying my very floral Waitrose mug on my desk at work, Maria encouraged (read: told) me to Instagram it. We had a little think about whether we should encourage others to do the same. 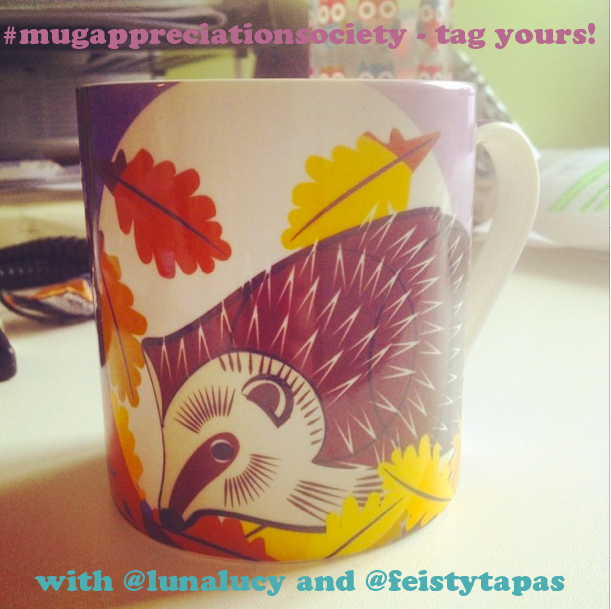 I flippantly suggested that we tag the pictures the #mugappreciationsociety although at first Maria wasn’t too convinced. “Isn’t it a bit long?” she asked before doing some cursory research and declaring that perhaps it was the hashtag we should go for. So we did. My friend Maria (Feisty Tapas) has been helping me get my life in order. I am a slightly chaotic person with a bit of a ‘to hell with it’ streak, and it’s not really served me well these past few years. So I am in the process of drawing up a life plan for the next two years to get me to where I need to be in my work life, with financial independence, getting ready for slightly scary things like babies and part of this plan is my own personal new age of austerity. Part of the reason I’ve had to take an abrupt turn and take myself down this path is due to personal health issues that have forced my hand a bit. I’ve had to cut back on some working hours and have a rethink about how I am still going to aim to Make Things Better for myself. So instead of looking at my ingoings and outgoings and panicking a little inside and then trying to carry on as if there’s no issue, I’m going to make the most of what I have – learn to live responsibly, sustainably and still have a bit of fun along the way. Part One of the plan is my food bills. I am going to embrace making meals with my slow cooker – until now, it has just been a nice shiny contraption that I won in a charity auction for a few pounds that has been sitting on my kitchen countertop. I also need to learn how to shop on a budget and not just play at it. I know vague prices of something things, but couldn’t tell you how much a can of beans costs. Although I do know the cost of a loaf of bread and it’s ridiculous. So home baked bread is definitely back on the menu. 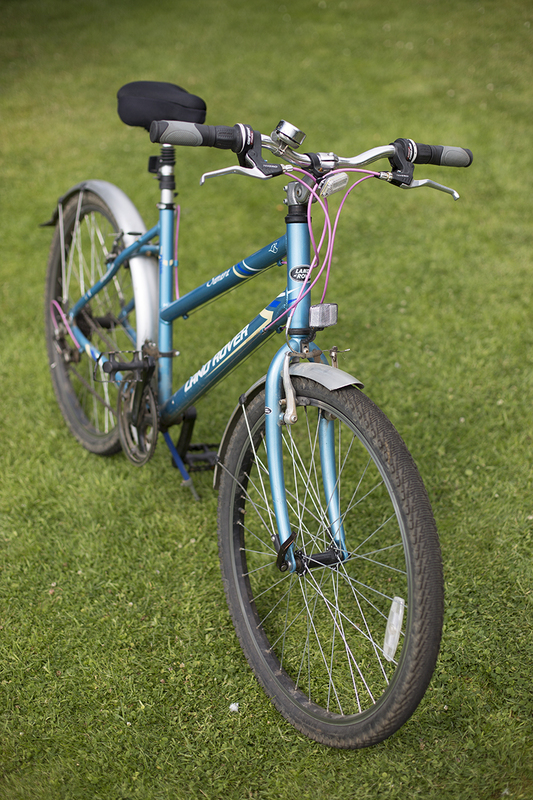 My very modest but very useful third or fourth hand bike – anyone got a basket?! Part Two is the car issue. We have two cars, both of which are old and prone to bits dropping off, and recently both cars decided to break at the same time. But luckily Rich is a man with skills and has been working diligently on getting my little 1.2 Corsa fixed and back on the road. It would have cost us more than the car is worth to get it fixed by a mechanic but having someone around with a vested interest and the patience to Fix All The Thing has been a God-send. But really, the car issue isn’t so much about getting the cars back on the road. It’s about not putting so much bloody petrol in them. So the bike has been dusted off and I’m thinking about getting a basket for it (second hand, of course) so I can nip up to the farm shop or the supermarket and do all the local stuff without burning through £1.30 per litre of petrol. Plus, I could really do with the exercise. Part Three is simple. Lucy does not need any more pairs of Toms shoes, however much she likes them. Part Four is putting my wardrobe on hold until I’m desperate. I have enough clothes. There are car boot sales locally where you can pick up some great pieces for a couple of quid. Goodness knows Mum manages to fill out her wardrobe with good quality items and great labels at a fraction of the cost. So I just need to look and learn, and stay away from the surf shops. Part Five is growing even more food. Part Six is all about reduce, reuse, recycle. And upcycling. Part Seven is all about asking myself if I really need to buy something, and learning to say no (Maria, I have you telling me no a lot in my head when I’m in the danger zone).